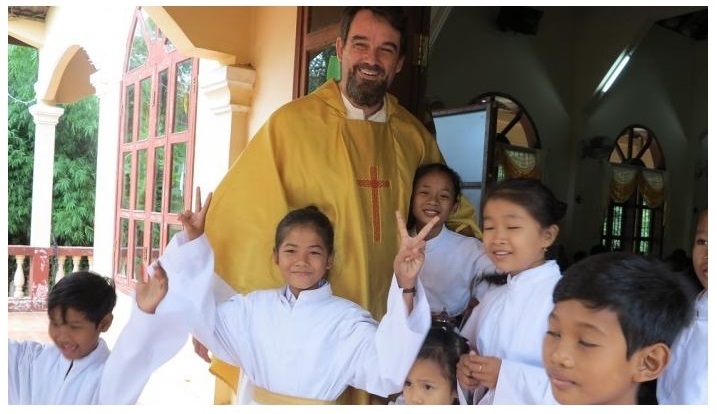 Kdol Leu, Cambodia -- Father Luca Bolelli from PIME Missionaries, sent a very interesting article to Asia News with regard to young people and the new challenges of the Cambodian society and its development. Cambodia is at a critical juncture. In the past few years, it has been moving into the modern world from a predominantly rural society that existed for thousands of years (...) Always having the Lord beside us and walking with him gives them [young people] a lot of strength, the light to make the choices they have to make and courage in carrying them forward. Italian Father Bolelli, who has been in Cambodia for 11 years already, has seen those rapid changes from a mostly rural society to a more urban tendency: "This was not possible before. Imagine that when I arrived in this village, just nine years ago, I was the only one with a mobile phone. Now, I am the one with the cheapest model. All the kids, even those from poor families, have a smartphone that, at a low cost, puts them in touch with the world," he explains. He reflects also about the contribution of the Catholic Church on the education of Cambodian children and youth, where the Salesians have an important role: "The Cambodian Church is very much involved in the education of young people through schools, linked to Salesians or some parish and missionary group, youth centres for students going to government schools and then go home, youth groups that are not common in Cambodia." Bolelli, Luca (2018). Young people’s leading role in Cambodia’s Church and society. Asia News, 10/16/2018.